SoundMagic unveils C range of budget headphones | What Hi-Fi? As far as budget headphones go, we've been banging the drum of the SoundMagic E10S headphones for some time. They won a What Hi-Fi? 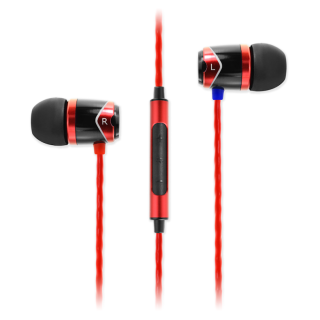 Award in 2015 and are currently our go-to recommendation for anyone looking to upgrade the headphones that come with Android and Apple smartphones. But SoundMagic has decided now is the time to replace them and the entire S range with a new SoundMagic C range of budget in-ear headphones. The C stands for 'compatibility', and the E10C, E50C and E80C all feature a mic and three-button remote with its own 'intelligent switching' system. There's a small micro-chip in the remote which automatically switches poles on the headphone jack, so you can team the buds up with both Android and Apple smartphones. On the outgoing E10S you had to manually flick a switch on the control. The SoundMagic E10C headphones go on sale in early June, and will cost £40, the same price as the current E10S buds. The SoundMagic E50C (pictured above) go on sale early July for £50 and the SoundMagic E80C arrive in early August for £70.